Tech Tip #2: Equivalent Lengths - Southwark Metal Mfg. Co. Proper airflow distribution is critical to the performance of residential forced air heating and cooling systems. Sheet metal pipe, duct, and all the connecting fittings are produced in many sizes and styles to enable the contractor to make the proper installation in all types of residences. Each type, style, and configuration of fittings (elbow, angle, takeoff, reducer, diffuser outlet, register boot, etc.) 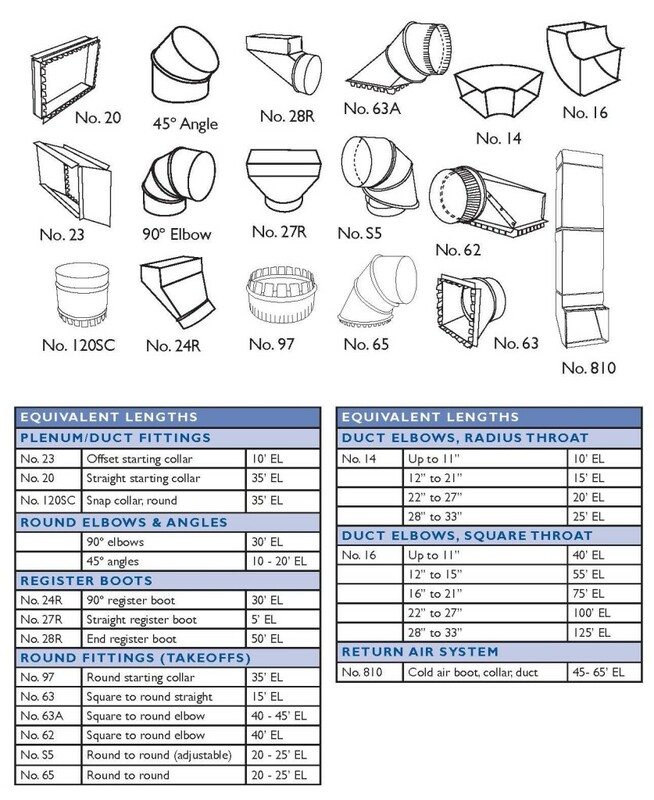 is listed in ACCA’s Manual D with an assigned “equivalent length.” This value is the comparison “length” of this fitting to an equivalent length of straight pipe or duct. For example, each elbow used is equivalent to 30 feet of straight pipe or duct. Southwark Metal Mfg’s sheet metal pipe, ductwork, and fittings conform to this system of equivalent lengths as well as conforming to industry national standards for describing residential fittings. Why are Equivalent Lengths Important? The design factor, calculated from the above formula, and the required airflow (CFM) are then used in a duct calculator to determine the size of all supply and return duct. Note: The Duct Design Center presents tips and information for general approximations only. All local codes and manufacturer’s instructions should be taken into account first and foremost when designing a distribution system.